Broadcasting the Archive is a project that arose from the urgency to spread the Arte Útil archive, a project initiated by Tania Bruguera, beyond the institution which hosts the material. Being the initial archive researchers, we started thinking how to make visible the incredible potentiality that the archive (intended as a tool) has. Therefore, our desire is to re-activate and mediate the archive in different geographical, cultural and social contexts in order to test the effectiveness of the strategies we have been investigating so far. Last September we started with some workshops and informal discussions, which led us to a more structured series of activities we proposed in Liverpool, UK – in collaboration with the Office of Useful Art and in St. Louis, US – in collaboration with The Luminary. In both cases we spent some time meeting local constituencies, artists, curators, writers, urban planners and users, digging into the history of these places and tried to understand if a common ground could be identified between the two communities. Alessandra Saviotti: I was in St. Louis for six weeks where I was curator-in-residence at The Luminary. I spent most of my time engaging with the local art community mostly related with Cherokee Street area, as well as other practitioners developing projects all around the city. The people I met had different backgrounds, but more or less all of them connected via theCommunity Arts Training (CAT) Institute alumni network. The presence of the CAT program has stimulated the growth of an art scene devoted to socially engaged practices, community art and cultural activism, helping to redefine the city’s identity through the arts. When I was there I noticed very clearly that this city is a place where social tension is palpable, especially due to residential segregation and criminalization of the use of public space. St. Louis remains one of the most segregated cities in the US with a visible dividing line between wealthier (mostly white people) and poorer (mostly black people) along Delmar Boulevard, commonly called the ‘Delmar divide.’ Many conversations were about which role art should have in this kind of context and the word ‘gentrification’ came up many times. This particular focus on the archive’s relationship to projects dealing with gentrification developed naturally in both cities. A recent article by Dan Ancox in The Guardian recognizes how the word ‘gentrification’ deals with emotions and it has an almost endless potential to arguments, because it speaks to fundamental rights like the right to housing, among others. Ancox continues, stating that in recent years the topic has become mainstream and, as a consequence, opposition to gentrification is rapidly becoming more organized. People living in places torn by gentrification are well aware of what their future could be. 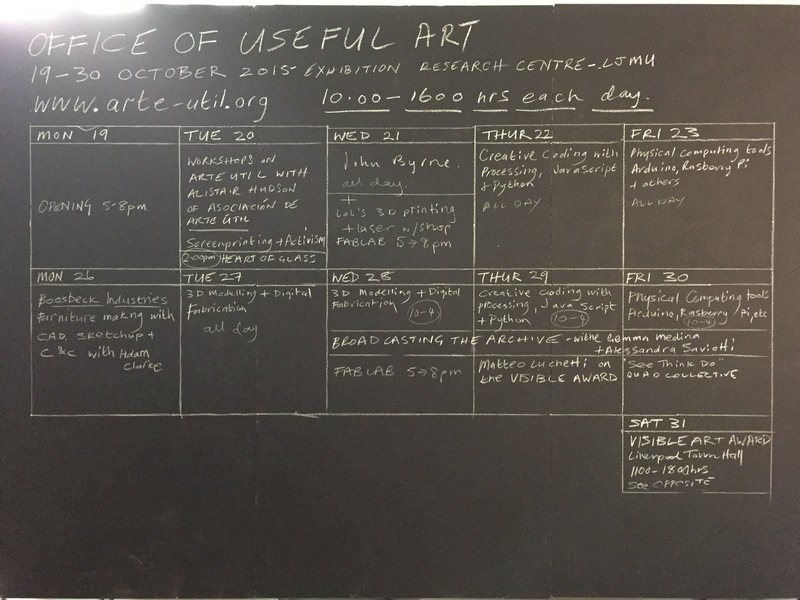 Gemma Medina: In my case I was invited to participate in the Office of Useful Art (OUA) for four days. 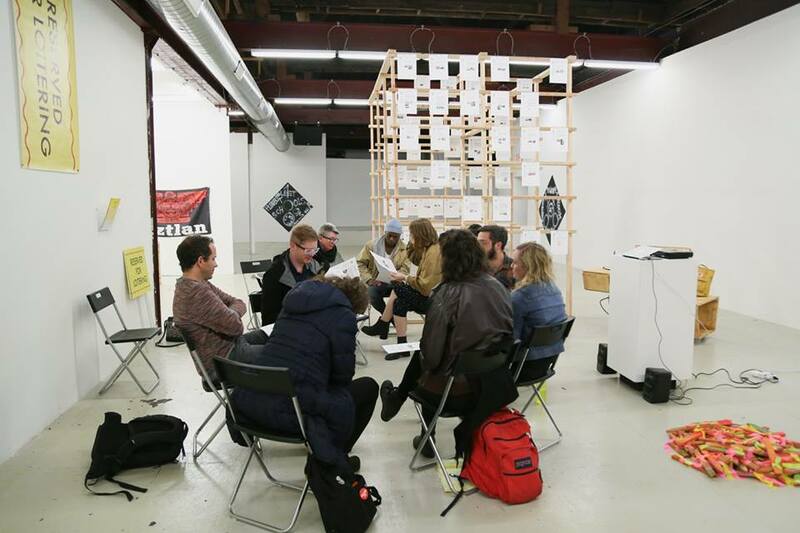 The OUA was a collaboration between Liverpool John Moores University (LJMU), Tate Liverpool and Middlesbrough Institute of Modern Art (MIMA) to expand the understanding of Arte Útil and socially engaged art practices as bridges to connect institutions and community projects. The Office was located at the Exhibition Research Centre (ERC) within the John Lennon Art and Design Building. Recovering the local tradition and the history of the school as a ‘Mechanics Institute,’ the Office included a range of tools to be used freely by the participants like a 3D printer, serigraph, laser cutter, etc. This fact largely defined the people involved with the program of activities and the ones who came to use the equipment. The majority of visitors were composed by art students or groups involved with technological and experimental projects related to the University in some way. Even in my limited time in Liverpool, I had the opportunity to visit some community projects, being part of the open public jury discussion of The Visible Award and attend the community arts conference organized by the Liverpool Biennial. AS: It is curious to notice how naturally we decided to activate the project in both locations implementing the idea of the ‘open office.’ We sought to place focus on the question of hospitality and openness adopting the same approach and process, starting from one to one meetings and then opening the floor to occasional visitors for conversations. However, in St. Louis I didn’t focus on the ‘making’ but more on conversations and tours around the city to understand the context, which is very different from ours in Europe. Yet, I can affirm that some analogies exist between Liverpool and St. Louis. Both of them saw a fast rise and then a huge crisis between the 60’s and the 70’s whose effects are still visible. The infamous Pruitt-Igoe area in St. Louis, for instance, is such a visual admonishment to a certain modernist political plan that is still hard to digest. Local artists like Juan William Chávez, Ilene Berman [NODhouse], the coordinators of The Pink House [formerly connected to the Rebuild Foundation] and many others I met, activated their projects in either marginal or difficult neighborhoods, but they did it with the community living there, as a form of resistance; especially taking the city as an inspiration to react to the current situation. Projects like Homebaked or Granby Four Streets are based on a similar concept of co-ownership and working together: neighbors, designers, architects and artists, on the same level. But in fact, as many Arte Útil projects, they are directly reacting to the current state. As you mentioned, it is distinctly an act of resistance to the market and neoliberalism. In the case of Granby Four Streets, the project started with the activism of a small group of residents, a core group of older ladies, firmly opposed to leaving their houses. 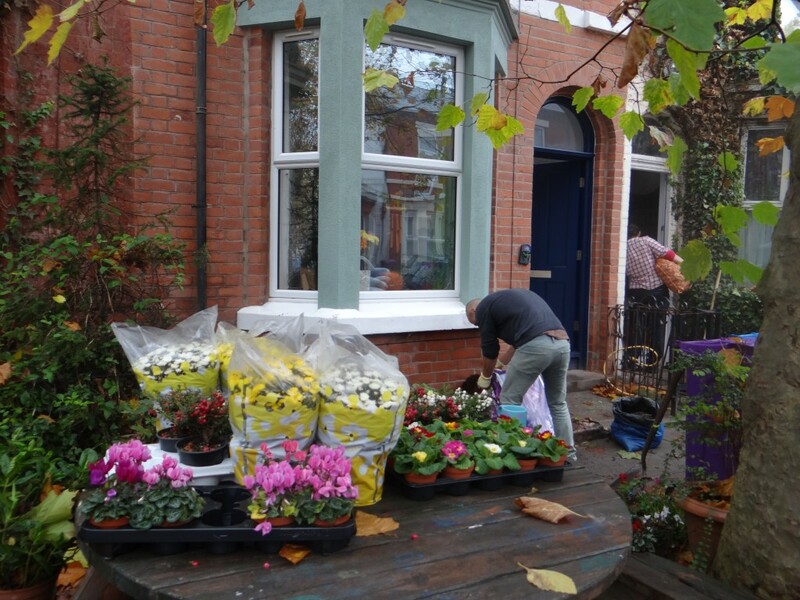 They stayed and initiated a guerrilla gardening campaign to green the streets, improving the aesthetics of the urban environment and recovering the sense of community. As soon as the interdisciplinary group Assemble got the assignment, they moved into one of the houses that they should rehabilitate. They listened to the community and made decisions together, designing an affordable model and refurbishing the buildings side by side with the neighbors from the very first moment. As Lewis Jones and Fran Edgerley (members of Assemble) told me, their practice is based on rethinking the way in which the cities are made, conventionally in a very transitional top-down way, determined by the market. They propose to turn it around, looking for alternative ways, empowering people during the process of building their own neighborhood. Granby Four Streets like many other Arte Útil projects, demonstrates that another reality is possible and it shouldn’t be defined just by the dictates of the market and political agendas. They are opening up our imagination, providing us with effective strategies. As we have discussed several times, it is paradoxical that after winning the Turner Prize, as part of the controversy arisen, they have been described as “acritical,” accusing the project of being an almost completely depoliticized response to a highly politicized social situation and even some jurors were accused to be promoting a “new conservatism.” For us, it was disappointing to see this orthodox reaction from those who clearly didn’t experience the context of the project. 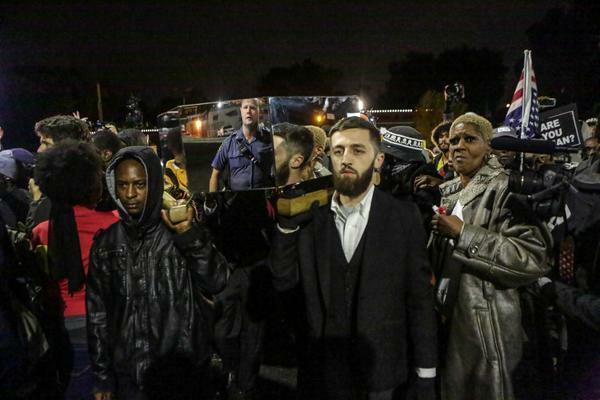 AS: We both came across different cases that are currently in the spotlight: the collective Assemble winning the Turner Prize in the UK and “The Mirror Casket,” an artwork created by a group of artists and activists to support the #Blacklivesmatter’s protest in St. Louis, being acquired by the Smithsonian’s National Museum of African American History and Culture. I met some of the artists and activists who created the piece (De Nichols, Mallory R. Nezam, Marcis Curtis from Citizen Carpentry, among others) and I asked them how they felt about it. Of course, the very first reaction was excitement, then fear of the work being instrumentalized, and finally the awareness of a possibility to use the power of an institution like the Smithsonian to actually maintain autonomy toward the project. Eventually, the work was sold for thousands of dollars after ten months of negotiation and the profit was put back into the activities of the movement. I mention this case because I believe that the transdisciplinarity of this action – like the majority of the projects we have in the archive – came from a sort of shift happening in education. Key to St. Louis’s art scene is the CAT program, a transdisciplinary institute that matches people with very different backgrounds under the same roof of the art. The most interesting fact is that during the program students are really working in cooperation. The effect of it is that most of them stay in the city, perhaps start non-profits or other organizations and remain connected through a real network of solidarity. The initial investment they are putting in the city is paid back form the response of the city itself, in a way. Various Authors, ‘The Mirror Casket’, 2014. Protesters carry the casket in front of police station. Ferguson (MO). Photo: Lawrence Bryant/St. Louis American. The issue of being instrumentalized by the government is present, but due to the different system in the United States, is not perceived as a real danger. However, the relationship with art institutions is relevant and helpful in some cases. GM: I agree. The collective Assemble went through a similar process with the Turner nomination. Finally, they decided to use the institution and the visibility of the prize to gain incomes for the community of Granby. They transformed the Granby Workshop into a social enterprise, manufacturing handmade products used to refurbish the houses where every product can be bought online. The risk of instrumentalization is always there, but there is a fascinating question around many Arte Util projects: who instrumentalizes who? In the Office of Useful Art, we had some interesting discussions about the relation with art institutions. There exists a huge gap between cultural institutions and local communities in Liverpool. In that sense, socially engaged art projects are bridging this gap clearly and building long-term process of dialogue and mutual trust. In some conversations with the participants of the projects there was not a real confrontation or counter-movement against cultural institutions, but the feeling that they are invariably in a power position and they don’t offer enough support or agency to independent local initiatives dealing with culture and society. 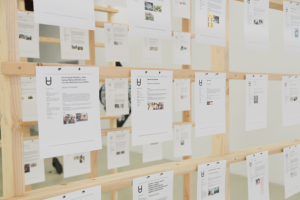 In this respect, the Arte Útil archive is a platform to build up relations with the institutions and provides a network with other projects and practitioners around the world. It is a tool in many different levels not just for the researcher, but also for the institutions, for the practitioners and the projects. In both cases Broadcasting the Archive has functioned as a device to investigate the local contexts and to understand the relationships between different actors working in the cities. The fact that many artists are using the same strategies in such different environments reinforced the idea that Arte Útil could be defined as a transnational movement. Having an archive, which can be considered as a hub, where people can finally understand that these practices happen on a global scale, could function as a sort of ‘shelter’ for the artists. Broadcasting the Archive also served as a tool for analyzing failures especially when an artist tried to replicate a successful project. Despite the fact that many case studies have been successfully implemented in different places, we need to take into account that every context has its own history, urgencies and practitioners. Sometimes it is simply wrong trying to push for a new implementation of the same successful case study in a different location from where it originated. The risk is to appear as a sort of franchise that pretends to activate something for the community, instead of withit. And it simply doesn’t work. Finally, the archive ended up as an important pedagogical resource for students and schools. Through the workshops we organized, we met some artists who are teaching in different art schools who decided to include the archive as an important resource for their classes, in Liverpool and in St. Louis as well. Broadcasting the archive, workshop, The Luminary, St. Louis. Photo: Brea McAnally. You can read this conversation also in Italian on Droste Effect: Bulletin.